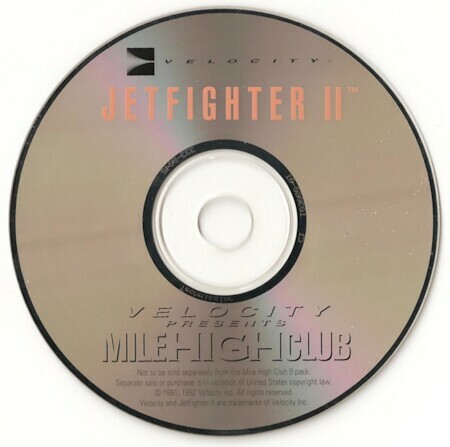 Jetfighter II offers five flyable aircraft, the entire west coast of California, carrier ops and appealing graphics. It's easy to step into thanks to its relative simplicity. By 1990 standards, the 3D aircraft models are nice, and the user-controllable external camera means you'll definitely get a good look at them. It's fun to buzz around in JF2, especially in San Fransisco where you'll get a chance to weave through buildings and bridges. The atmospheric color effects are nicely done, and the sky actually darkens as you gain altitude. The sun and moon trade places as night falls and the sky turns a deep shade of purple. You can dispatch enemy fighters with Phoenix, AMRAAM, and Sidewinder missiles, or switch to the cannon if you're in the mood for a challenge. The ground attack arsenal features Mk82 and Mk84 bombs, and there are kinetic energy missiles for variety. A weapon cam lets you see the carnage firsthand. Carrier landings, which require you to deploy the arresting hook, are nicely modeled. The game provides an ILS to help line-up the approach, and if you're right on the money, you can switch to a tower view to catch the last exciting moments. 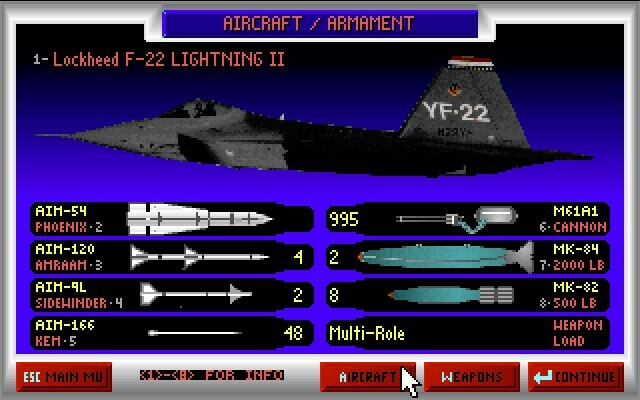 In all, Jetfighter II, like Chuck Yeager's Air Combat, was a very good sim for its day. Its instant flight mode lets you jump into any of the planes at various airports on the coast, with up to three bogeys to make things interesting. In addition, it offers a single mission mode and a campaign mode called "The Adventure," where you'll fight for control of the west coast. JF2 offers five aircraft - an F-14, F-16, F-18, F-23 and F-22. 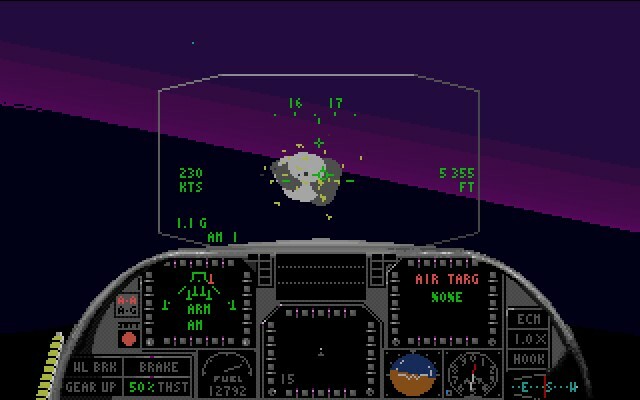 Graphics were good for its day, with a convincing gradient horizon and subtle light-source shading on the planes. Performance is great on 386 and 486 CPUs. The environment features some of the more notable San Fransisco landmarks, such as the Golden Gate Bridge and the pyramidal Transamerica building. JF2 is a good beginner's sim and is a good example of the state of early 90s flight sims.